I know you love that horse! And what, on earth, is that rusty thing with wheels? Metal stool is SOLD. These goodies will make their way to Primitiques tomorrow morning. The way I see it...if someone comes and buys, then that will fund more shopping, next Shopping Addiction Friday. See the plan? 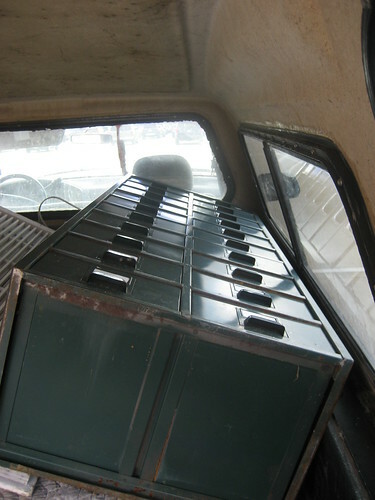 Check out this metal multi-drawer cabinet. I have two. And they are scrumptious. They'll be in the store in Terrell (Poetry) tomorrow, too. Feel free to feed my habit and come out for a visit tomorrow. I'll be there working for a little bit. Here is the map if you need a refresher. And now, as with all such meetings, I am headed to the cookies and punch table. Thank you for your support and Happy Weekend! Looking forward to seeing them in person! I am so jealous. 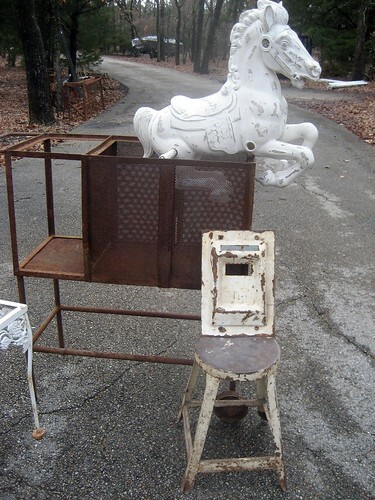 I especially love the metal cabinet and the beautiful horse! Thanks for sharing! Why do you have to live so far away from me? 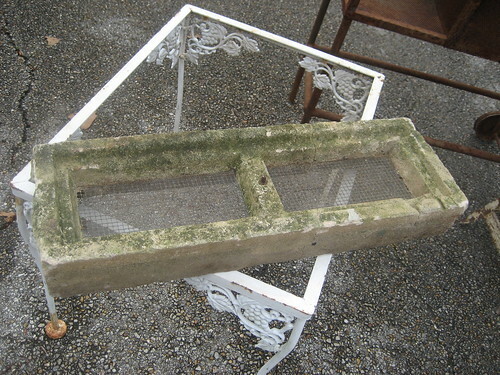 Why does everything I want (e.g., that concrete vent) have to be so impossible to ship? Woe is me! I love the rusty thing on wheels! I love the metal cabinet!!! Thanks for sharing. Love the Horse, I had two boutiques for many years named the Clothes Horse, so our logo was a carousel hourse, I still have several. Great finds Mindy!! Why oh why must I live in Ohio? I am laughing while I stand with you at the cookies and punch table. Not because I have a shopping addiction but because I want some cookies and punch.... oh and the bar stool. How quick do I have to get to you to get the bar stool? Not that I have a shopping addiction... bar stool. What kind of cookies are we having? Hi. My name is Robelyn and I have a bar stool addiction. Girl you did good, wish I lived close! Love that metal scrolly coffee table thingy, so me! But I also love that trough you've been dragging around you house, too. Shopping, I believe is built into our genetic DNA! And hey, I finally got my first copy of Elle Decor, wonderful! Thank you dear Mindy Belle! My name is Angélique and I have a shopping addiction...more like a file cabinet addiction..and a rust addiction..and a chippy paint addiction....and a ....u get the idea. The cabinets are especially impressive in person. Completely functional and in excellent condition. Great find! Such fabulous finds, Mindy. How do you find all this amazing stuff and have a "big-girl job" at the same time?! !